EDIT: Surprise, my blog changed it's name (but don't worry, it's still about Star Wars). I didn't see you coming, but I'm glad you came. It seems that you've stumbled upon my little blog. I hope you'll stay a while. This is just my first entry and I'd hate for you to leave so soon. You don't even know why I'm making this blog, do you? Well, it's simple really. I like love Star Wars. Always have, you see. I mean, I liked Han Solo before he ever shot first and I've been a Luke Skywalker fan despite the whines about power converters. I've seen the movies more times than I care to admit. It's not just the movies, though... I've read pages upon pages of beautiful prose (Hah! I couldn't say it with a straight face) that has covered everything from Luke re-building the Jedi Order, to Freedon Nadd corrupting the people of Onderon. I've played my healthy share of Star Wars games, and I even own the Star Wars Holiday Special. My point is this: Star Wars is a part of who I am, and that's why I'm writing this blog. Hence the URL of this website is brianonstarwars.com. I am Brian, and this is my take on Star Wars. Now, words are great and all, but how can you really trust one paragraph of them on the internet? How can you know that I'm a true Star Wars fan? I suspect that there is no way I can actually convince you... But I hope that you'll give me a chance and that my blog will speak for itself, screaming to the interweb that "Brian Shaw is indeed a Star Wars nerd!" I don't cower behind the title, I crave it. With that being said, I'd like to start/conclude (it's hard to tell really) with a brief explanation of this blog's title: "No Disintegrations." To many Star Wars fans this won't need any explanation. But to anyone else venturing to read this blog, I'll inform you. In the 2nd installment of the Star Wars franchise, "Episode 5: The Empire Strikes Back," Darth Vader is on the look out for the Millennium Falcon. He knows that Luke, his real target, isn't on the Falcon but figures it will be easier to catch Han and Leia (who are on the Millennium Falcon) and then to use them as bait to lure Luke in. In order to track down the Falcon, Darth Vader calls up several bounty hunters. Here they are! Dengar. He's a human with a bandage on his head. IG-88. IG-88 is an assassin droid with way too many eyes. Boba Fett. Does any self-respecting Star Wars fan not know who Boba Fett is? Bossk. A Trandoshan, or lizard man. 4-LOM. A protocol droid (like C-3PO) who went crazy and became a criminal. And finally, off screen is a small-in-stature but very dangerous bounty hunter named Zuckuss. His face sort of looks like a bug face. "There will be a substantial reward for the one who finds the Millennium Falcon. You are free to use any methods necessary, but I want them alive." Then Darth Vader stops his pacing, looks right at Boba Fett and says... You guessed it! "No Disintegrations!" Apparently Darth Vader or the empire has worked with Boba Fett before, and apparently last time Boba Fett got a little too excited about a bounty he was chasing and likely obliterated it/him/her. Could this be a subtle clue that Boba Fett is totally awesome? Probably. I'm not a huge Boba fan myself, but I love the quote, and so now it has become my blog title. There you have it. That is how I titled my new blog which I hope will catch on and go crazy viral. You can help by following this blog and sharing this with your friends! Every little effort helps. 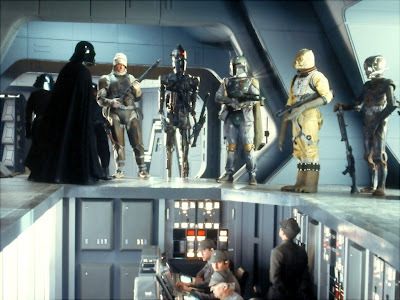 Click Here for a link to a video of the "No Disintegrations," quote.